Features: Turquoise Blue Moccasin Style Slippers, Rubber Soles, Soft Cloth Material, Cushioned, Machine Wash, Indoor/Outdoor. Size : Small 5-6. Excellent - Only slight signs of wear. Does not diminish the overall appearance of the item. Suede look. Any boot or shoe forms pictured are not included. Elastic gussets. Good - Shows signs of regular use. COMFORTABLE SLIPPERS. COLOR: DEEP PURPLE. LADIES SIZE: LARGE 9-10. - INDULGE AND PAMPER YOUR FEET. - INDOOR/OUTDOOR SOLES. 100% Textile. Toe Style: Closed Toe. In 1947, our founder turned her vision into reality when she brought the cloudlike comfort of foam to fashionable slippers. Many years later, our dedicated design team continues to create incredibly comfortable products that people love to wear. Size Chart for Dearfoams. Sole: 100% Thermoplastic-Rubber Machine Wash Cold Water. Size Small 5-6. Large 9-10. 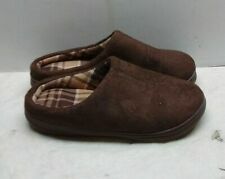 DEARFOAMS LADIE'S VELOUR SLIPPERS NWT * LARGE * OFF WHITE Free Ship!